In a survey of just under 300 specialist nurses working with men affected by prostate cancer, conducted for Prostate Cancer UK by LSBU, Plymouth University and Mouchel, almost half (49%) reported that they were approaching retirement or intending to leave nursing within the next ten years. But with no clear plans for training a new workforce and prostate cancer predicted to become the most common cancer overall by 2030, patients face a future without the experience and expertise these nurses offer. The report was co-authored by Alison Leary – professor of healthcare modelling at LSBU – who warned: "Findings suggest that care for the needs of men diagnosed with prostate cancer could be put in jeopardy as a result of an over-stretched, under-valued and diminishing nursing staff. Urgent attention needs to be given to strategic workforce planning to develop expertise and ensure that the workforce is a sustainable one. The development of new opportunities for both entry level nurses to entice new talent, and leadership positions to retain existing talent will be key in this." Owen Sharp, Chief Executive of Prostate Cancer UK said: "Nurses are telling us that they are over-stretched beyond belief, they feel undervalued and they simply don't have time to give every patient the dedicated support and care he needs. Couple this with the fact that a significant chunk of the workforce is soon retiring – as incidence rates for prostate cancer are expected to rise - and the picture becomes even bleaker. "Every man diagnosed with prostate cancer, no matter where they live, should have access to a nurse with specialist knowledge and training in prostate cancer care. But for this to happen, we need prompt, decisive action. "We are calling on Chief Nursing Officers and local providers across the UK to take a long hard look at their urology nursing workforce. There's still time to avert this crisis if they act now - put new incentives in place to retain the excellent workforce that currently exists, enable them to do the jobs they are trained to do, and get a training programme up and running so new nurses start to come through." 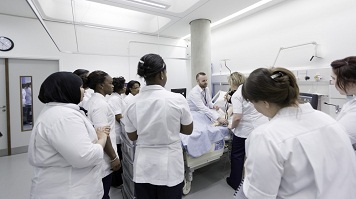 LSBU's School of Health and Social Care provides high quality education and training, working with more than 50 NHS partner organisations from in and around London to deliver a wide range of educational programmes for a variety of healthcare professionals.